Hamzeloo-Moghadam, M., Danaifar, N., Mostafavi, S., Hajimehdipoor, H. (2015). Formulation and quality control of Prunus domestica syrup, prepared according to Iranian Traditional Medicine. Research Journal of Pharmacognosy, 2(2), 13-17. M. Hamzeloo-Moghadam; N. Danaifar; S.A. Mostafavi; H. Hajimehdipoor. "Formulation and quality control of Prunus domestica syrup, prepared according to Iranian Traditional Medicine". Research Journal of Pharmacognosy, 2, 2, 2015, 13-17. Hamzeloo-Moghadam, M., Danaifar, N., Mostafavi, S., Hajimehdipoor, H. (2015). 'Formulation and quality control of Prunus domestica syrup, prepared according to Iranian Traditional Medicine', Research Journal of Pharmacognosy, 2(2), pp. 13-17. Hamzeloo-Moghadam, M., Danaifar, N., Mostafavi, S., Hajimehdipoor, H. Formulation and quality control of Prunus domestica syrup, prepared according to Iranian Traditional Medicine. 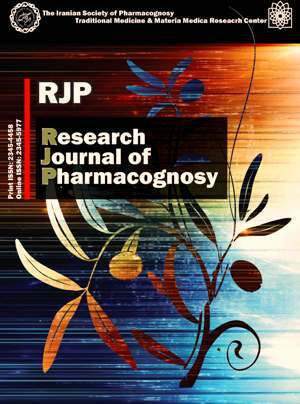 Research Journal of Pharmacognosy, 2015; 2(2): 13-17. 2Department of Pharmaceutics, School of Pharmacy and Pharmaceutical Sciences and Isfahan Pharmaceutical Sciences Research Center, Isfahan University of Medical Sciences, Isfahan, Iran. Background and objectives: Prunus domestica (plum) has been considered as a useful remedy for several disorders in Iranian Traditional Medicine (ITM). It has cold and wet temperament and is used as syrup for hot temperament diseases such as hot headache and stomach disorders. In the present study, plum syrup has been formulated according to ITM manuscripts and quality control evaluations have been accomplished to present a suitable formulation. Methods: The fruits of Prunus domestica L. were macerated in water, then decocted. The mixture was filtered. The filtrate was concentrated to have a suitable viscosity. The extract was sweetened by adding sugar (1:2) and heated till sugar was completely dissolved. The final product was evaluated physicochemically and microbiologically according to standard protocols and total phenolics content of the syrup stability was determined. The syrup was assessed in accelerated condition (40 ºC) during 6 months. Results: The prepared formulation was a viscose and brown syrup with plum flavor and fragrance. No precipitation and cap locking were observed in the syrup. Dry residue, pH, density, viscosity and total phenolics of the syrup were found 43.1%, 3.49, 1.27 g/ml, 6.5 cP and 152.3 mg/100ml, respectively. No microbial growth was observed in the formulation. In the accelerated stability tests, no remarkable changes were seen in the product. Total phenolics content was decreased 2.2% during 6 months in 40 ºC. Conclusion: The formulated Prunus domestica syrup could be introduced for further mass production after completing the final required evaluations. Ghahraman A, Okhovvat AR. Matching the old medicinal plant names with scientific terminology. Vol 1. 1st ed. Tehran: Tehran University, 2004. Ansari A. Ekhtiarat-e-badiee. 1st ed. Tehran: Razi Pharmaceutical Distribution Company Press, 1992. Tonekaboni M. Tohfat-ul-momenin. 1st ed. Tehran: Traditional Medicine and Materia Medica Research Center of Shahid Beheshti University of Medical Sciences and Nashr-e- shahr Press, 2007. Aghili Shirazi MH. Makhzan-ul-adviah. 1st ed. Tehran: Iran University of Medical Sciences, Research Institute for Islamic and Complementary Medicine, 2008. Avicenna. Al-qanun fi al -tibb. Beirut: Dar Ehia Al-Tourath Al-Arabi, 2005. Rhazes. Al havi. 1st ed. Afsharypuor S, (Trans.) Tehran: Academy of Medical Sciences, 2005. Zakeri Marvast AR. Formulation of sodium valproate syrup. Pharm. D. thesis. Shahid Beheshti University of Medical Sciences, Tehran, Iran, 1998. World Health Organization. Quality control methods for herbal materials. Malta: World Health Organization, 2011. U.S. Department of Health and Human Services. Guidance for industries, Q1A (R2) guideline. Stability testing of new drug substances and products. Rockville: ICH,2003. Mahmood A, Ahmed R, Kosar Sh. Phytochemical screening and biological activities of the oil components of Prunus domestica Linn. J Saudi Chem Soc. 2009; 13: 273– 277. Kayano S, Kikuzaki H, Fukutsuka N, Mitani T, Nakatani N. Antioxidant activity of prune (Prunus domestica L.) constituents and a new synergist. J Agric Food Chem. 2002; 19; 50(13): 3708-3712. Nakatani N, Kayano S, Kikuzaki H, Sumino K, Katagiri K, Mitani T. Identification, quantitative determination, and antioxidative activities of chlorogenic acid isomers in prune (Prunus domestica L.). J Agric Food Chem. 2000; 48(11): 5512-5516. Fujii T, Ikami t, Xu JW, Ikeda K. Prune extract (Prunus domestica L.) suppresses the proliferation and induces apoptosis of human colon carcinoma Caco-2. J Nutr Sci Vitaminol. 2006; 52: 389-391. Soni M, Mohanty PK, Jaliwala YA. Hepatoprotective activity of fruits of “Prunus domestica”. Int J Pharma Bio Sci. 2011; 2(2): 439-455. Kosar S, Fatima I, Mahmood A, Ahmed R, Malik A, Talib S, Chouhdary MI. Purunusides A-C, alpha-glucosidase inhibitory homoisoflavone glucosides from Prunus domestica. Arch Pharm Res. 2009; 32(12): 1705-1710. Ahmed T, Sadia H, Batool S, Janjua A, Shuja F. Use of prunes as a control of hypertension. J Ayub Med Coll Abbottabad. 2010; 22(1): 28-31. Hooshmand S, Chai SC, Saadat RL, Payton ME, Brummel-Smith K, Arjmandi BH. Comparative effects of dried plum and dried apple on bone in postmenopausal women. Br J Nutr. 2011; 106(6): 923-930. EFSA Panel on Dietetic Products, Nutrition and Allergies (NDA). Scientific opinion on the substantiation of health claims related to dried plums of ‘prune’ cultivars (Prunus domestica L.) and maintenance of normal bowel function (ID 1164, further assessment) pursuant to Article 13(1) of Regulation (EC) No 1924/2006. EFSA J. 2012; 10(6): 2712.